Mullein is an easy-to-grow plant, often seen in disturbed areas such as fields and ditches. A multi-purpose herb, mullein is credited historically with healing abilities from its flowers, leaves, and root. Mullein is also a useful addition to your landscaping. The flower stalk grows up to 6 feet high, and the leaves grow up to 2 feet across. Try growing a beautiful specimen in an area where bees can enjoy the blossoms, and birds can eat the seeds. Mullein grows in the wild, but if you harvest it there, please do so responsibly. Mullein is considered an invasive weed in many states, but many of the 300 varieties are suitable to grow as ornamentals in home landscapes. Hybrids bred for the home garden are not as invasive as the common mullein. Mullein (Verbascum thapsus) is a biennial that grows in USDA hardiness zones 3 through 9. It prefers full sun and dry soil. Mullein needs space. The plant grows from 6 to 10 feet tall unless you purchase one of the new cultivars that reach only 5 feet. To prevent mullein from spreading in the landscape, you need to remove the fuzzy rosettes that appear on the plant. Remove the flower stalk before the seeds disperse to prevent a widespread seeding. Mullein is an attractive flowering landscape plant with a rich history as an herbal remedy. When it is grown as an herbal remedy, every part of the mullein plant is usable at different times during its life cycle. The thick, soft leaves are made into a tea to treat respiratory illness by loosening congestion and helping clear the lungs. The tiny hairs on the leaves can be irritating, and any teas should be filtered carefully to avoid this problem. A tincture of mullein alleviates this problem, although it is extremely bitter. 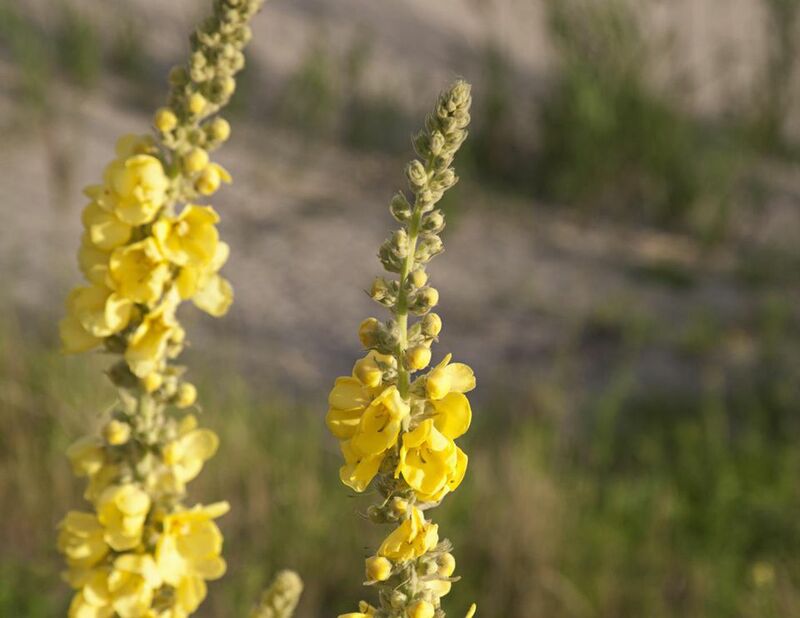 Mullein flowers provide a soothing and cleansing effect on the skin. As a wash, they are an easy treatment for minor wounds and scrapes. These same flowers can be picked throughout the growing season, placed in olive oil and left to infuse. The resulting infusion is used for earaches that do not involve a ruptured eardrum. Add beeswax to the infused oil, and you have a balm that is a welcome addition to any baby's changing table. The delicate skin of a baby's diaper area can benefit from a light layer of mullein balm. Mullein root has been used to treat urinary tract issues. The plant has a long taproot, which makes it difficult to harvest and nearly impossible to transplant. When harvesting, be sure to use a spade and dig when the soil contains some moisture. Mullein is an accurate indicator of a soil's contamination level. When looking for wild mullein, only harvest from straight, vigorous stalks. The crooked stalks indicate a high level of chemical contamination in the soil. The leaves are usually gathered the first year of growth, although the second year leaves are supposedly as effective in medicinal teas. The stalk and blossoms grow the second year. The flowers are harvested daily, as they open. The root is also harvested. Opinions vary on when the best time for root harvest may be. Many growers believe the root should be harvested when the plant's energy is highest, that would be the first year in the fall. However, this harvest time prevents the blossoms that normally appear the second year.